Beneath the tranquil pastoral green landscapes of the Sorek and Elah valleys lies a dramatic story about the region in ancient times. Draining the western slopes of the Jerusalem Hills, the two valleys at first cut deep, narrow courses through the mountainous region before opening out when they reach the foothills, in the area of the Shephelah. The Sorek Valley, the northernmost of the two, begins in the vicinity of Ramallah and descends toward Beth Shemesh—today, the old Jerusalem to Tel Aviv railway line passes through it. The Elah Valley originates in the proximity of Bethlehem, and the road leading to Jerusalem from Mount Gilo runs next to it. The two valleys meet near Ashdod, before reaching the Mediterranean Sea. During the Late Bronze Age, Canaanite period ( c. 1550–1200 bce), no powerful city-states developed here. From a diplomatic archive uncovered at Tell el-Amarna in Egypt, which includes several hundred letters sent by Canaanite kings to the king of Egypt during the 14th century bce, we learn that the two important Canaanite cities at this time in the Shephelah were Gezer (in the Ayalon Valley) and Lachish (in the Lachish Valley). However, in the subsequent biblical period two powerful Philistine city- states were located in these valleys: Ekron (Tel Miqne), next to the Sorek Valley, and Gath (Tell es-Safi) in the Elah Valley. Biblical, historical, and archaeological data together indicate that at the beginning of the 12th century bce, the Philistines established five city-states in the southern part of the Land of Israel. In addition to two in the Shephelah—Ekron and Gath—three were constructed along the Mediterranean coast— Ashdod, Ashkelon, and Gaza. According to biblical tradition, the Philistines were an immigrant population from “Caphtor,” possibly Crete or another part of present-day Greece. Archaeological research has reached similar conclusions based on the style of pottery vessels and other finds from the ancient occupation layers of the Philistine cities, as well as inscriptions of the Egyptian pharaoh Ramesses III, which mention the Philistines as one of the “Sea Peoples,” and analysis of the linguistic characteristics of the Philistine names known to us (such as Achish, a Philistine ruler of Gath, and Goliath). Archaeological excavations show that in the 12th–11th centuries bce (Iron Age I), Ekron was an important Philistine center, extending over an area of 20 hectares (almost 50 acres). Public buildings and dwellings attest to a developed culture. This large city was destroyed at the end of the 11th century bce, survived as a relatively small site during the 10th– 9th centuries bce (Iron Age IIA), before expanding again in the 8th–7th centuries bce into a central site of the same extent as previously. Gath, on the other hand, was a relatively small site in the 12th–11th centuries, but grew to become the major site, with an area of some 40 hectares (almost 100 acres) during the 10th–9th centuries bce. This giant city was destroyed around 830 bce by Hazael, king of Aram-Damascus, the same ruler who left the inscription found at the site of Tel Dan in northern Israel that mentions the “House of David” (see p. 28). Thus we learn from the Bible: “At that time King Hazael of Aram went up, fought against Gath, and took it” (2 Kings 12:18). The two cities, located close to each other, present a mirror image in terms of the course of their histories. It is interesting that there is a correspondence between the biblical tradition and settlement archaeology in the Sorek and Elah valleys during the periods in question. In the Book of Judges and at the beginning of 1 Samuel, which reflect the Iron Age I period, two traditions have been preserved concerning this region, and both are situated in the Sorek Valley. The first relates to the legendary Samson, last of the Judges, who kills the lion and obtains honey from its corpse, attaches burning torches to the tails of foxes, and carries the heavy gates of Gaza upon his shoulders (Judges 13–16). Samson lived with his family at Zorah (Tzorah), adjacent to the Sorek Valley, and he twice married Philistine women from the valley. His first wife was from Timnah, generally identified with Tel Batash (located next to the modern village of Tal Shahar). His second wife was Delilah. While the Bible does not mention where she lived, it notes that: “...he fell in love with a woman in the Sorek Valley.” After several attempts, Delilah succeeded in discovering the secret of Samson’s tremendous strength: his long hair, which had not been shorn since his birth. She cut Samson’s hair while he slept, rendering him powerless, so that the Philistines managed to overcome him, gouged out his eyes, and incarcerated him. As a final heroic act that resulted in his death, Samson pulled down the columns of the temple of Dagon in Gaza, killing 3,000 Philistines. His brothers collected his body and brought it for burial in the tomb of their forefathers, between Zorah and Eshtaol. Each tale about Samson has legendary content, but it should be noted that in terms of geography, his activities are mainly centered around the Sorek Valley. The second tradition relating to the Sorek Valley tells of the Ark of the Covenant, which was kept in the Tabernacle at Shiloh in the Samaria Hills and was sent with the Israelite army into battle against the Philistines. After one victory over the Israelites, the Philistines captured the Ark and took it to various cities, where it caused grave damage to temples and people (1 Samuel 5–6). At Ashdod, for example, the statue of Dagon breaks, and its head and hands were severed and found lying at the threshold of the temple. The Ark finally arrives at Ekron, causing death and serious illness. After seven months, the Philistines decide to return the Ark to the Israelites, with compensatory offerings of gold, in the hope that they may thus assuage the anger of the God of Israel. Having placed the Ark in a cart pulled by two cattle, they traveled directly up the Sorek Valley to Beth Shemesh. Traditions connected to the Elah Valley are preserved in the books of Samuel and Chronicles, which relate to Iron Age IIA. It is at a place called Ephes-dammim, between Socoh and Azekah in this valley, that the young David kills Goliath with a single sling-stone (1 Samuel 17. Later, David finds refuge with Achish, king of Gath, a city identified with Tell es-Safi in the Elah Valley, and then in a cave at Adullam in the same valley. 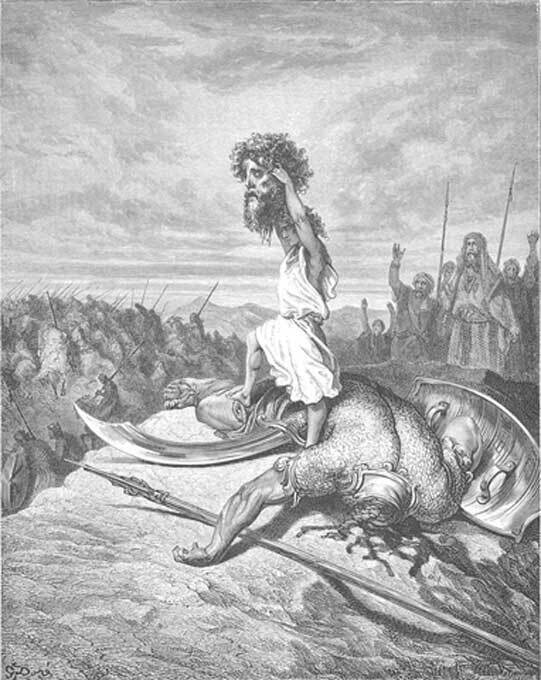 David hoists the severed head of Goliath as illustrated by Gustave Doré,1866 ( public domain ). 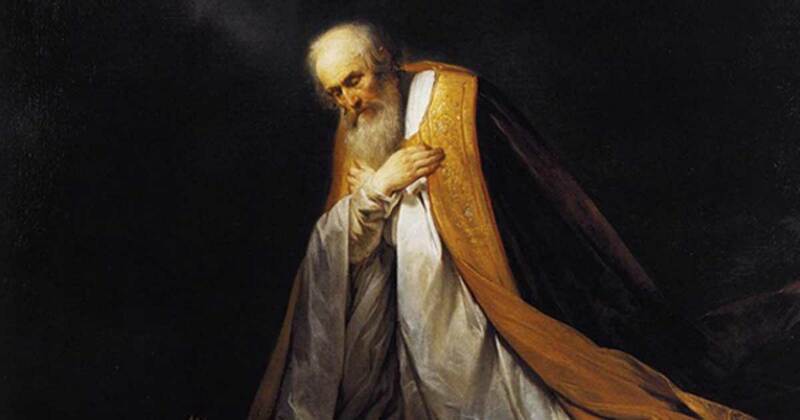 Some of these traditions may sound like gross exaggerations to the reader today. 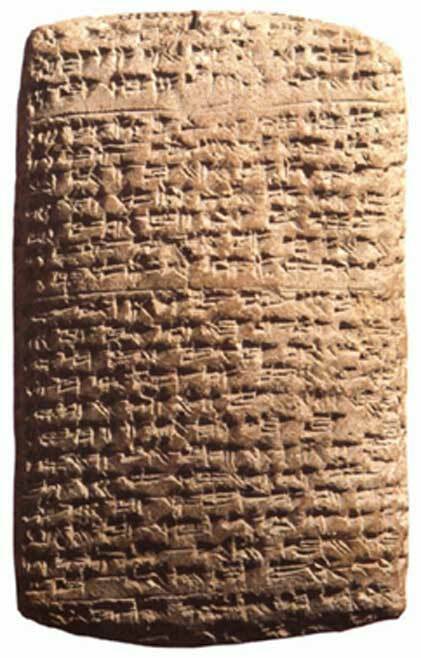 But modern research is less interested in the precise content of the events described and more in the basic and fascinating correspondence between the location of the important Philistine centers that emerges from archaeological-historical research and the geographical location of the biblical traditions. As noted above, during Iron Age I, in the 12th–11th centuries bce, Ekron, which is located very near the Sorek Valley, was the dominant Philistine center, and the biblical tradition accordingly places the narrative concerning the Philistines in that valley. On the other hand, during Iron Age IIA, the 10th–9th centuries bce, Gath in the Elah Valley became the dominant Philistine center and the biblical tradition recounting the border disputes between the Philistines and the Israelites accordingly shifts from the Sorek Valley to the Elah Valley. The archaeological picture provides us with deeper insight concerning the way in which the ancient biblical tradition was shaped: border disputes between the two different populations, reflecting a historical process that continued over hundreds of years, were condensed into a folk tale with legendary elements, in which each of the two population groups is represented by a single main character: Samson or David and, opposing them, Delilah or Goliath. At night, around the campfire, when the elders of the tribe told the younger generation about history, hundreds of years were shrunk into a brief episode that lasted for a few years or even a single day. In order to keep their listeners entertained, a layer of legend was added to the events: the enormous strength of Samson or the incredible height of Goliath. Modern research cannot ignore these traditions and regard them simply as baseless legends. It is obliged to analyze them, and must attempt to distill from them the complex historical processes that extended over hundreds of years. Yosef Garfinkel is Yigael Yadin Professor for the Archaeology of the Land of Israel, Biblical Archaeology Department of the Institute of Archaeology, Hebrew University of Jerusalem, and head of the Berman Center for Biblical Archaeology. Saar Ganor is an archaeologist with the Israel Antiquities Authority. He codirected the excavations at Khirbet Qeiyafa. Michael G. Hasell is an American archaeologist.